RadioSpirits.com - STOP THE PRESS! 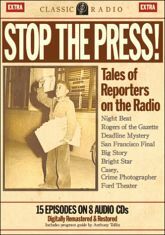 From hardboiled to homespun, newspaper reporters were featured prominently as dramatic characters during the Golden Age of Radio in the 1940�s and 1950�s. Radio Spirits is pleased to bring together 15 of these classic audio shows for your listening pleasure, all digitally remastered and restored. Stop the Press! includes the critically acclaimed drama Night Beat starring Frank Lovejoy, the folksy Rogers of the Gazette featuring Will Rogers Jr., the delightful light comedy Bright Star with Fred McMurray and Irene Dunne, the classic Front Page starring Everett Sloane, the hardboiled Deadline Mystery starring Steve Dunne, the long-running Casey, Crime Photographer with Staats Cotsworth along with San Francisco Final starring Jeff Chandler and Big Story, both featuring dramatizations based on actual news stories of the day. Joining these stars are some of the finest supporting radio actors of the day, including Parley Baer, Joan Banks, Harry Bartell, Jackson Beck, Ed Begley, William Conrad, Ted DeCorsia, John Dehner, Larry Dobkin, Georgia Ellis , Virginia Greg, Bill Johnstone, Byron Kane, John Larkin, Jan Minor, Jeanette Nolan, Mary Patton, Vic Perrin, June Whitley, Barbara Jean Wong, Ben Wright and more.